DOSA.. the most common breakfast in my kitchen. I never get tired of making dosa in every morning. But sometimes, i will get bored of making the same recipe every day. So, even though i can't spend more time for making breakfast in school days, i will try my level to the maximum for a different and attractive breakfast (mostly with dosas only, haha.) 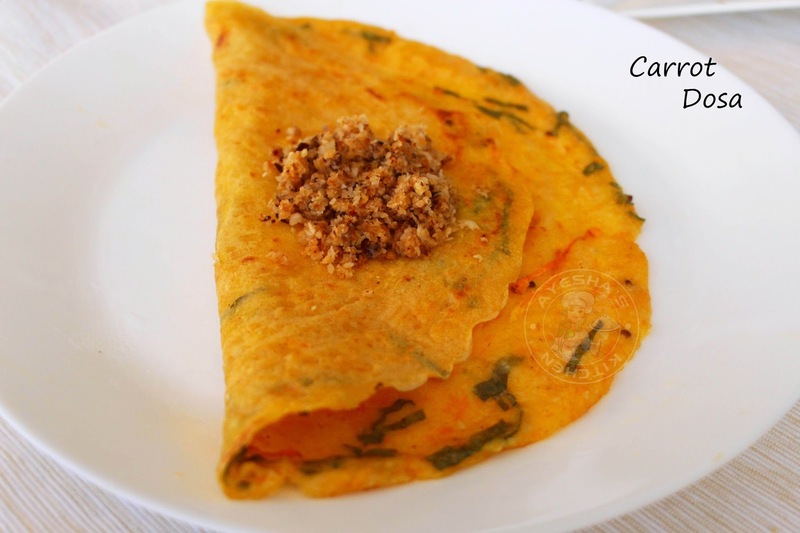 Carrot dosa is a wonderful breakfast idea for kids. This is one of the healthy breakfast recipes for kids with its natural color and flavor. Kids dislike eating vegetables. It is really very difficult to feed toddlers. Me too have one, who loves finger foods and chocolates only. This is one of the ways I make her eat veggies. And this is one of the easy carrot recipes for kids. Am i right friends? Carrot dosa is very healthy and tasty dosa recipe which can be served on its own or with some condiments. In south Indian breakfast menu, dosa varieties will be the main attraction. 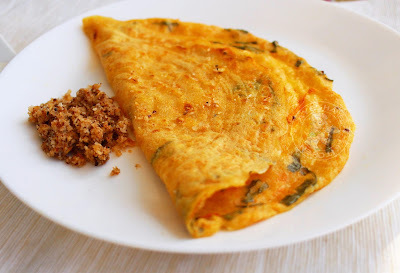 Do try this Indian breakfast recipe at home. You can also check my other dosa varieties which are given below. Wash well before soaking and then Soak idli rice / parboiled rice, urad dal, fenugreek seeds, bengal gram in enough water for 5 hours. Grind them until smooth texture after 5 hours by adding little by little water (do not add more water at a time). Grind them in batches. No need of water for the wet grinder. Transfer it to bowl, add salt and mix well. Some add salt only while making dosa. But i used to add dosa immediately after grinding. Leave it overnight for fermentation. (required minimum 8 hours in summer and it differs according to the climate). Next day take the batter and mix well. SEASONING - Grate the carrot and make a fine paste of it using a grinder by adding little water. Heat a pan with some oil and saute this carrot paste along with a pinch of salt until it is cooked. When done, add this to the prepared batter along with some chopped coriander leaves. Add water (may be half a cup) required for making a batter of thick pouring consistency. Once the flame is medium low, pour a ladle full of dosa batter and then quickly spread it evenly in a circular motion from center to outside with the back of that ladle. You can make the dosa very thin for more crispiness. I made soft dosa as my kid doesn't like crispy dosa.